Activision has a lot of money. Bobby Kotick has fat stacks, too. The publisher's CEO saw his total cash-and-prizes compensation jump from $8.1 million in 2011 to $64.9 million in 2012, reports Bloomberg, a figure that would make him the second-highest paid CEO among publicly traded U.S. companies. Kotick is due for another $16 million if the company hits performance targets, too. The bulk of his compensation came in the form of stock awards valued at $55.9 million. (Though they vest over the next five years, Activision is required to report them all at once, now.) The cash salary he got was roughly the same as always, $8.33 million. Still, a corporate governance consultant has had a beef with Activision's executive pay in the past, and this doesn't make her any happier. “We don’t like any element of this pay package,” Nell Minow, of GMI Ratings, told Bloomberg. "In the past we have expressed concern about this company and its compensation practices." Minow said Activision isn't being clear about how Kotick earned the money. "The lack of information provided by the compensation committee is a red flag," she told Bloomberg. "It’s very difficult to discern how they determined this compensation package from the information that’s been provided." She said the stock awards aren't sufficiently tied to Kotick's performance and said the whole compensation package is out of line with the video game industry. 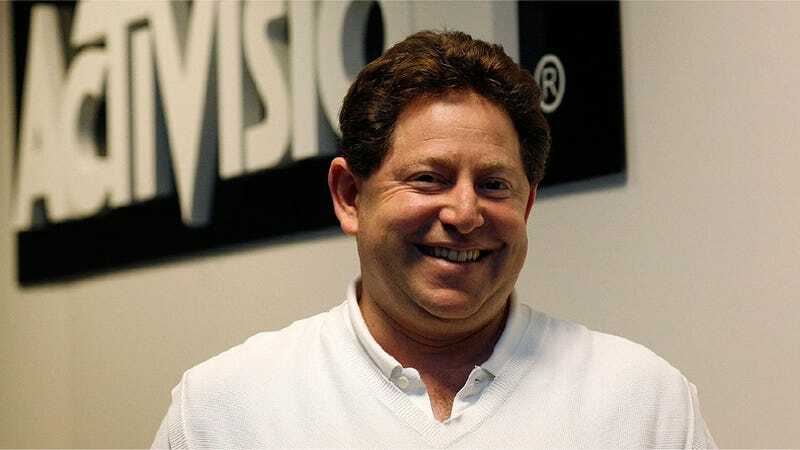 It doesn't just make Kotick the highest-compensated CEO in games publishing, the dollar value of his entire package last year would place him second only to Oracle CEO Larry Ellison in executive compensation for 2012, Bloomberg said. Neither Activision nor its majority owner, Vivendi, responded to their requests for comment. Editor's note: Bloomberg has since revised its story to draw a distinction between Kotick's cash compensation and the cash value of his stock compensation. Our post has been edited to reflect this.